ROK Tiger Division, A-Battery, 10th Artillery Battalion, posing at their tactical base at Dong Xuan, southwest of Qui Nhon, with a few Yanks in 1970. Presented by Vietnam Veterans of Korea. Korea’s Capital Division was the first to deploy, though we have seen at least one reference to the ROK Marines being the first to deploy. We'll leave it that they both arrived at about the same time, which is true. The Capital division deployed beginning in September 1965. The Capital Division was formed from the Capital Security Command in February 1949, having evolved from the 1st Regiment of the Korean Constabulary, responsible for Seoul. On June 25, 1950, North Korea invaded the ROK, Seoul fell four days later, and allied forces were pushed south to the Pusan Perimeter, where they stopped and stood. Two important events ended the enemy advance. US Marines land at Inchon, September 15, 1950. First Lieutenant Baldomero Lopez, USMC, leads the 3rd Platoon, Company A, 1st Battalion, 5th Marines over the seawall on the northern side of Red Beach, as the second assault wave lands, 15 September 1950. Wooden scaling ladders are in use to facilitate disembarkation from the LCVP that brought these men to the shore. Lt. Lopez was killed in action within a few minutes, while assaulting a North Korean bunker. He received the Medal of Honor posthumously for his gallantry in this assault. U.S. Marine Corps Photograph, from the collections of the Naval Historical Center. Presented by US Naval Historical Center. The US Marines landed at Inchon, ROK on September 15, 1950, easily defeating the enemy force there. This landing forced the enemy to retreat from the Pusan Perimeter , and enabled the allies to break out of the Pusan Perimeter in southeastern ROK, and head north through ferocious fighting at impressive speed. The second event was that the ROK I Corps, which included the ROKA Capital Division, invaded North Korea from the east coast in September 1950, and captured Wonson, North Korea on October 11. That enabled an unopposed American landing at Wonson a few days later. The ROK II Corps crossed into North Korea as well, moving into central North Korea. Following their lead, the US 8th Army crossed thereafter. Pyongyang fell that same month. By October's end, ROKA forces had made it to the Yalu River and the border with China. While we do not want to minimize the difficult fighting, the fact is that US and ROK forces, once they took the offense from the Pusan Perimeter and Inchon, cut through the North Korean Army like a hot knife through butter. Thousands of enemy surrendered or fled. By the end of October, the North Korean Army at best could be called dysfunctional. Only two Chinese Communist Armies crossing into the war saved them, and they only put things back to where they were before the war broke out. Fast forward 15 years from the shaky start of the Korean War. The Capital Division set up shop in Vietnam during fall 1965 in a strong position, including two infantry regiments with three battalions each, four field artillery battalions, an armor company and several other support companies. USS Vernon County, LST-1161. Presented by the Home site for theUSS Vernon County. The Capital Division began its deployment to Vietnam in September 1965. The USS Vernon County, Landing Ship Tank (LST) 1161, was among those US 7th Fleet vessels bringing the Tigers to Vietnam, directly from Korean waters. The USS Terrellwas another. This photo shows "Korean troops coming ashore at Qui Nhon," presented by the US Army Transportation Museum. We do not know the date of this photo. It gives us a chance to mention that Korean units, like American ones, moved often by US Army heavy boat companies. For example, the 97th Heavy Boat Co. at Cam Ranh Bay supported combat landings up and down the coastline, throughout II Corps. Moving troops by vessel along the coast was among the most safe ways of moving them. This is a ROK Tiger "Compound" at Qui Nhon in 1965. Photo credit: Tiny Freeman. Presented by the 84th Engineers. Obviously, life improved. This is Camp Thunderbolt, headquarters and home of the ROKA's Capital "Tiger" Division, near Qui Nhon, RVN. Presented by Vietnam Veterans of Korea. The division settled in at a place called ROK Camp Thunderbolt, RVN, near the city of Binh Khe and the An Khe pass, and not far from the city of Qui Nhon, in Binh Dinh Province, northern II Corps. The 161st Aviation Co. arrived at the port of Qui Nhon in late November 1965. They set up camp on a hill in the An Sou Valley, about 12 miles west of Qui Nhon. There was nothing there, and the unit had to build what they could build from the ground floor up. They even built a wonderful chapel on a small knoll overlooking the base. This all would be re-named Lane Army Airfield (LAAF) after CW2 Robert C. Lane, the first 1st Air Cavalry Division Sky Crane casualty of the war. This 1965 photo shows the beginnings of Lane AAF at An Sou. Photo contributed by Mike Verdecchia, 170th AHC. Presented by 161st AHC. This is the Tiger area at Lane AAF. At center, you can sort of see the ROK flag flying. Photo credit: Sp5 Randy Putnam, Gunner and Crewchief, 174th AHC, Feb 1967- Feb 1968. Presented by 174th AHC. The Koreans provided security for Lane AAF. Members of the 161st have commented that they rested easy knowing the Koreans had that responsibility. They have said that whenever the VC tried to attack the field, the Koreans would retaliate quickly and lethally. We have seen many comments like this from American GIs deployed to locations secured by the Koreans. The division was known by several names. It was the Capital Division, nicknamed the Tiger Division, the Maeng Ho (Brave Tiger) Division to Koreans. Most of its operations were called "Maeng Ho (Nr.)." Its area of responsibility (AOR) was Binh Dinh Province, northern II Corps, RVN, colored pale red on the map below. Vietnam Military Regions and Provinces. "The Viet Cong are continuing to make significant gains in the northern and central provinces of South Vietnam, particularly along the low coastal regions. Viet Cong effectiveness in Binh Dinh Province was manifested in their ability to isolate the coastal districts and to restrict government control to all but the district towns and heavily populated areas." There was a fear that the ARVN might not be able to prevail in Binh Dinh, and the VC might be able to split II Corps. Splitting the corps was a NVA objective; they thought they could prevail if the province were split in two. In August 1965, when the first US Army combat units arrived in Vietnam, virtually the entire Binh Dinh Province, the most populous coastal province, was controlled by the North Vietnamese and VC. The same held true for Pleiku Province to the west. In 1965, the city of Qui Nhon was the only secure town in the province. Much of Binh Dinh province had been a hotbed for VC activity for nearly two decades before the Americans or Koreans ever arrived. It was one of 11 provinces that formed the most central military region of the RVN, known as the II Corps Tactical Zone, and among the most strategic. Route 1 ran north-south from Saigon along the coast all the way to Hanoi, North Vietnam. It intersected with Hwy 19 in the southern part of Binh Dinh Province, which ran east-west through neighboring Pleiku Province all the way to the Cambodian border. Binh Dinh Province was the Tiger Division's AOR. Key markers included Hwys 1 and 19, Qui Nhon (red dot), Phu Cat Mountains and Phu Cat Air Base (AB) (blue dot), and An Khe (green dot). The main task for the Tigers was to clear the province of the enemy. The Tigers did not come to Vietnam to fool around. Hwy 19 was high on their list of "things to do." It was a lifeline for allied forces, especially American, operating in Pleiku and Kontum provinces to the west. The Tiger Division started arriving in September 1965, and quickly took positions on Hwy 19 (QL19) from Qui Nhon to An Khe. This allowed the 1st Brigade, 101st Airborne Division "Screaming Eagles" to hold its position in and around An Khe. About a month later, the brigade turned over its area of responsibility (AOR) to the Koreans. Within two months the Tigers had moved north out of Qui Nhon and made it halfway to Phu Cat Mountain as well. One of France's finest combat regiments, Groupe Mobile 100, which had fought valiantly in the Korean War, drove across the Mang Yang Pass between An Khe and Pleiku in 1954 and virtually the entire regiment was destroyed. The road remains dotted by French graves. The Mang Yang Pass looking toward An Khe (east). Photo credit: Baker. Presented by the 15th Field Artillery Regiment. Hwy 19 through the Mang Yang Pass had a "hair-raising" hair-pin turn for all those who had travel it by convoy. This area was ripe for enemy ambush, and many occurred. This is a photo of it taken from a US Army helicopter gunship providing protective cover for a US convoy of the 1/69th Armor. Photo courtesy of Phil Gesell, 238th AWC, 1970-71. Presented by RJ Smith's 1/69th Armor "Panthers" web site. In January 1966, the Tigers hooked up with the 1st Cavalry and ARVN units to launch Operation White Wing-Masher-Thang where they cleared the northern half of Binh Dinh Province of the enemy. The operation terminated in March. Together, they destroyed the NVA 3rd "Sao Vang" (Gold Star) Division. This in turn enabled the US Marine 3rd Division to move into position to conduct Operation Hastings against enemy infiltrators through the DMZ father north. The 174th Assault Helicopter Company (AHC) “Sharks” arrived at Lane AAF during April 1966. The 161st AHC, mentioned previously, had been there and was located on the other side of the hill. his photo is of Lane AAF. On the left is the 161st AHC, on the right the 174th AHC area. Lane AAF was the 174th’s first base after arriving in Vietnam. The 174th spent most of 1966 supporting the ROK Tigers. The company was primarily assigned to support the ROKs and the 22nd ARVN Division. Korean soldiers search the jungle near Qui Nhon for enemy. Presented by US Army. By June 1966, the Capital Division controlled all the area north of Qui Nhon to the east of Hwy 1 and up to the base at Phu Cat Mountain. ROK Tiger Division Fire Support Base (FSB) set up near An Khe Pass. Photo courtesy of Phil Gesell, 238th AWC, 1970-71. (NB: Source said this was possibly a ROK FSB. We have other photography confirming it is). Presented by RJ Smith's 1/69th Armor "Panthers" web site. The Tigers extended their control to the north and south of Hwy 19 all the way into the An Khe pass, and south along Hwy 1 to the border between the adjacent province. This is a feat neither the French or the ARVN were able to accomplish in over 20 years fighting. This is a photo of a Tiger Division base at Phu Cat. Photo credit: John Stymerski. You can see the Phu Cat Mountains in the background. Presented by the C-7A Caribou Association. Entrance to the Tiger Division base at Phu Cat. Photo credit: John Stymerski. Presented by the C-7A Caribou Association. The moral of the story is the Korean Tigers quickly set up shop and took control. In October 1966, within the span of 22 days, the 22nd ARVN Division, the ROK Tiger Division, and the US 1st Cavalry Division (Airmobile) conducted three closely coordinated operations to destroy the enemy in the central and eastern portions of Binh Dinh province. Overall, the operation was best known as Operation Irving. They started by pushing various enemy forces out of their hideouts and toward the sea. They uprooted elements of the NVA 610th Division from mountain sanctuaries and then forced the enemy into a geographically contained pocket. The 1st Cav air assaulted into the pocket, the ARVN and ROKs attacked from the south, the ARVN heading to the northeast, the Tigers to the north through the Phu Cat Mountains. The ARVN and US Navy prevented any escapes to the sea and provided fire support. Artillery, USAF AC-47 gunships, Army helicopter gunships, and USAF B-52s all took part. Members of an engineer "Tunnel Rat Team" explore enemy tunnel during Operation Irving. Presented by US Army. With the coastal areas well under control, the 1st Cav moved to the west and air assaulted into enemy regroupment areas. They brought in engineers to destroy enemy tunnel complexes, and employed heavy doses of artillery. The enemy decided the battle was over. This enabled a major pacification effort to get underway in the province. The Koreans and ARVN both learned first hand the value of air mobile combat operations. The Tiger Division, and, the White Horse Division as well, employed a cordon technique wherein they would encircle an enemy stronghold in a strangle-hold. They would destroy enemy attempting to break out, and eventually starve them out. Some commanders complained that all this took too long, but ROK kill ratios demonstrated the pay-off to be lots and lots of dead enemy. "There were several key elements in their conduct of this type of operation. First, they are thorough in every detail in their planning. Secondly, their cordon involves a comparatively small area, probably not in excess of 9 to 10 square kilometers for a regimental size force. Third, the maximum force is employed, generally consisting of a regiment up to something in excess of a division. And finally, the operation is rehearsed and critiqued before it is begun. Units are moved into locations around the periphery of the cordon by a variety of means, including helicopters, trucks and by foot, but so timed that all arrive in position simultaneously to complete the encirclement. The density of the troops is such that the distance between individuals on the cordon is less than 10 meters. They leave little opportunity for the enemy to ex-filtrate in small numbers. Areas, such as streams and gullies, are barricaded with barbed wire and other barrier materials, reinforced by troops who may remain in water chest deep over night. The closing of the cordon is very slow and deliberate, not a rock is left unturned or piece of ground not probed. When the area has been cleared, they will surge back and forth through it to flush out any of the remnants. Another critical feature of their operation is the availability of reaction forces. The enemy soon knows when such a cordon is put around him. If he cannot ex-filtrate by individuals or in small numbers, he may attempt to mass his forces and break out at one point. Against such contingencies the ROKs utilize several reaction forces to reinforce critical areas. They have found that the enemy may make one or even several feints at various points around the cordon prior to making the main effort to breach the encirclement. Hence, the ROK deployment of reaction forces is by small incremental elements until such time as the main effort is located, and then the action becomes rapid and positive. Through the use of these tactics, the ROKs have developed the cordon and search operation to a fine state of art. The ratio of enemy to friendly casualties has been phenomenal, on one occasion in excess of 100 to 1." "An analysis of an action by Korean Capital Division forces during the period 23-29 January 1968 clearly illustrates the Korean technique. After contact with an enemy force near Phu Cat, the Koreans 'reacting swiftly ... deployed six companies in an encircling maneuver and trapped the enemy force in their cordon. The Korean troops gradually tightened the circle, fighting the enemy during the day and maintaining their tight cordon at night, thus preventing the enemy's escape. At the conclusion of the sixth day of fighting, 278 NVA had been KIA with the loss of just 11 Koreans, a kill ratio of 25.3 to 1.'" On line, April 21, 1968, Operation Maeng Ho 11, minutes before assault on Ky Son. Two ROK APCs and B21 in background, with 1/69th Armor tank Lt Hasty and Meerholz can be seen on their tank "Bootlegger" in the far background. In the ensuing firefight, Meerholz was killed, and Lt Hasty received the Silver Star for fighting with his tank. Photo credit: Barry Dwyer. Presented by RJ Smith's 1/69th Armor "Panthers" web site. Binh Dinh Province, especially the area north of Qui Nhon, was a rice-rich area. Despite the Tigers' best efforts, the enemy, especially the VC, would return, over and over. On April 23, 1968, following the defeat of the NVA in Tet 1968, the US 1st Battalion, 69th Armor, 4th Infantry Division married up with B Company 1st Battalion, 50th Infantry (Mechanized) and elements of the Tigers' 26th Infantry in an operation calledMaeng Ho 11, or Brave Tiger 11. Tiger Division infantry on a ground sweep with US 1/69th Armor tanks. Photo credit: Wayne Gunderson. Presented by RJ Smith's 1/69th Armor "Panthers" web site. The NVA had built 50 two-man bunkers in a tight semi-circle around a place called Ky Son, close to the coast. The enemy put its entire force inside the Ky Son area. The Tigers came in and surrounded the area, setting up their famed cordon. Air strikes and naval fire were brought in to prepare the battlefield. Then B Co., 1/69th Armor and ROK and US infantry moved into the cordon. The fighting was intense, the enemy tried a breakout, but B Company's tanks were positioned with a clear field of fire and together with the ROK infantry waiting for the breakout attempt, they destroyed 80 percent of the NVA force; 201 enemy dead for a 100:1 kill ratio. First Sergeant Maurice Ferry (left) and PSG Wellner, 1/69th Armor, with ROK Tigers, February 1969. Photo courtesy of Stretch Grohman. Presented by RJ Smith's 1/69th Armor "Panthers" web site. Korean instructor in Tae-Kwon-Do watches local South Vietnamese practice after instruction. Presented by US Army. The Koreans also took their Karate demonstration team around to the villages to impress and make friends with the locals. We will talk more about the warfighting impact of Tae-Kwon-Do when we talk about the ROK 2nd Marine Brigade "Blue Dragons." Suffice to say here that the Koreans felt they had a clear advantage in close hand-to-hand combat, and they employed that advantage whenever the enemy foolishly came close enough, with considerable lethality. 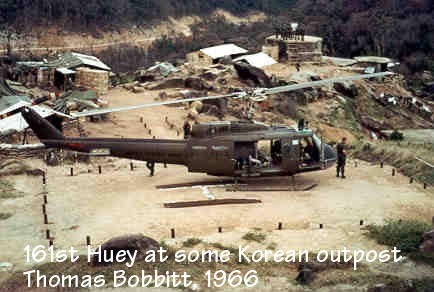 161st Huey at a Korean Tiger Division outpost, 1966. Photo credit: Thomas Bobbitt. Presented by 161st AHC. The US 161st Aviation Company "Pelicans" and "Scorpians" and the 129th Assault Helicopter Company "Bite and Strike" did quite a bit of business with the Tigers. The name of the game here was combat air assault. The 161st's area of operation throughout the first half of 1966 was in and around the Phu Cat Mountains. In April 1967, the 129th AHC, the "Bite and Strike," was assigned the mission to support the Tiger Division at Qui Nhon. As a result, the 129th moved from Khanh Duong to Lane AAF. During the 129th's first month flying for the Tigers, its men flew 12,908 sorties, to that point, an all time record for the company. This was a good combo. The Tiger Division quickly earned a reputation for being one bunch of tough cookies. The 129th pilots and gunners liked that, creating a business card that read, "You call, We kill," with the message, "Call us for death and destruction night or day." One of the first issues the 129th and Tigers had to deal with was providing the Tigers greater gunship support. The Koreans were reluctant to call for such support because of language problems, and some concern about gunship accuracy. To get by this, the 129th carried a ROK interpreter aboard. The 129th also demonstrated the accuracy of their fire to alleviate ROK concerns about fratricide. The 129th also found that the Koreans operated their three regiments in a large area, occupying semi-permanent areas, maneuvering at mostly platoon and company levels, mostly by ground. Together, the Tigers and 129th worked out plans to conduct assault operations by air, moving these forces around more quickly to more areas of hostile activity. Here are a few photos. Troops of the Maeng Ho Cavalry Regiment are lined up for the airlift to the 2nd phase of Operation Bun-Gae. Presented by Vietnam Veterans of Korea. ROK forces waving to departing helicopter and then moving out after their combat air assault landing, flown in by the 129th AHC. Photo credit: Barry Swanson. Presented by 129th AHC. The terrain in their area was rough, and landing zones (LZs) could usually only handle 2-3 helicopters at a time. Not all air assault landings were easy, as this photo shows. Soldiers are being air-dropped for Operation Maeng Ho #10 from a chopper (we believe 129th AHC) at a vulnerable spot. The helicopter could hardly land on the ground due to various difficult conditions. Presented by Vietnam Veterans of Korea. The Americans and Koreans worked together and started inserting Korean combat troops into blocking and attacking positions simultaneously. The Koreans grew to like the whole concept, as they were able to improve their performance against the enemy. In one of their early operations, they killed 47 NVA and captured 38 weapons using the technique. Enemy arms captured by ROK Tiger Division troops in an operation in early 1970 west of Phu Cat. Photo credit: Allan Hewitt. Presented by129th AHC. The Koreans were known not only for their uncanny ability to hunt down and kill enemy, they were also well known for a special capacity to uncover enemy arms caches, discover tunnels, and underground weapons storage areas. It was like they had radar in their noses. 129th AHC Bulldog resupplying ROK 105 Artillery post west of Phu Cat, early 1970. Photo credit: Allan Hewitt. Presented by 129th AHC. The 1968 enemy Tet offensive, of course, affected everyone in South Vietnam. This is a good place to pause for a moment and comment on the 129th AHC's experience with the Tigers in 1968. In January, the supposed beginning of Tet, and the monsoon season, the 129th flew almost 3,000 sorties for the Tigers and the Tigers killed 154 enemy. In February, Operation Ho San Guin II killed 28 more enemy, followed by Dok Su Ri Maeng Ho 10 killing 81 more, and the 129th flew 9,307 sorties. This operation continued into March and the Tigers killed an impressive 664 enemy and took 57 prisoners, employing the 129th for 3,263 sorties. April started slowly. Operation Dok Sa Ri Bunks 68-1 netted only nine enemy dead. But then Maeng Ho 11 kicked off in a major sweep from Phu Cat AB to the South China Sea from April 20-26, 1968. The 129th flew over 13,000 sorties. It just kept going like that throughout much of the year. Patrol Boat, rigid Mark II, widely used by Brown Water Navy in Vietnam. Presented by wikipedia. US Navy Game Warden Mobile Riverine Force operations, known as the Brown Water Navy, supported this ROKA Tiger effort on the Qui Nhon Peninsula, in an area known as the Second Coastal Zone (II CTZ), a coastal area roughly from just north of Qui Nhon south to Phan Thiet, which was below Cam Ranh Bay and Phan Rang. Game Warden was the nickname of Navy operations to interdict enemy traffic in the Mekong Delta. It was known as Task Force 116 (TF 116). By July 1968, shortly after this operation with the ROKs, TF 116 was covering the entire network of rivers and sloughs from the Cambodian border to the South China Sea and into I Corps. TF 116 mainly consisted of six River Divisions, each of which had from 3-6 River Sections. Originally, Game Warden had 120 Patrol Boats River (PBR), 20 Landing Craft (LCVPs), eight UH-1B Huey Helicopters, and four specially modified Landing Ship Tanks (LSTs). By mid-1968, the PBR inventory increased to 250. The LSTs operated as mobile bases for the PBRs, able to moor up to 16 PBRs alongside.